If you’re on the hunt for your next pair of headphones, you’ve got a lot to choose from. We’re not just talking about “over the ear” or “earbud” style headphones. We’re talking about the design, the durability, and of course the sound quality. Headphones can be designed for all kinds of purposes. Some are suitable for use in loud environments, so you can cancel out the morning traffic and drift away to your favorite album. Others are designed for slamming bass that will keep you pushing through your workout. Some even contain a plethora of features such as heart rate monitoring and speakerphone. The RF100 Bluetooth Headphones are no slouch in the features department, but their main focus isn’t gimmicks. 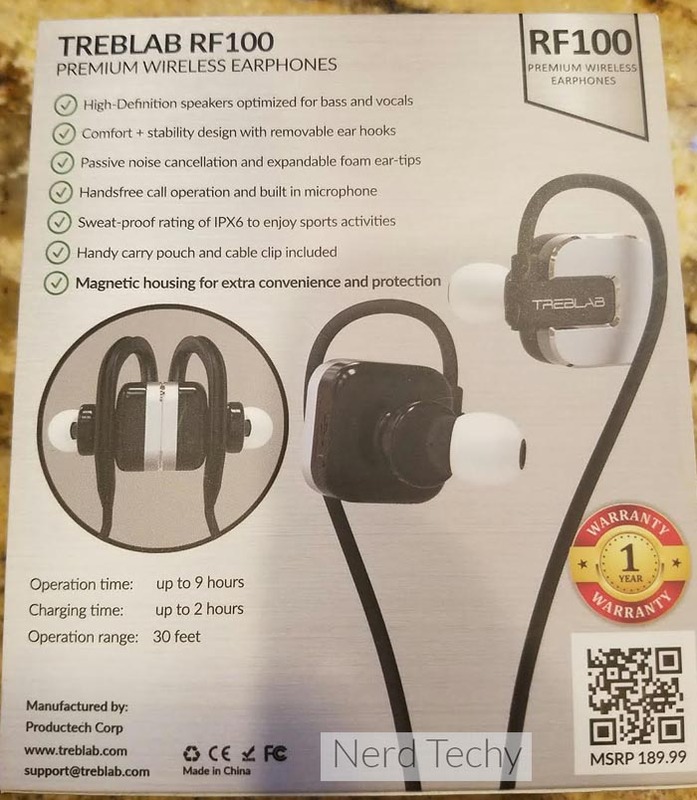 Treblab has, once again, done what they do best: Built a pair of earbuds that puts sound quality above all else. If you’ve read our other Treblab reviews or familiarized yourself with their product line, you’ll recognize their signature look in the RF100. They’re very boxy headphones, with the focal point being their attractive metal back and squared off ear grips. 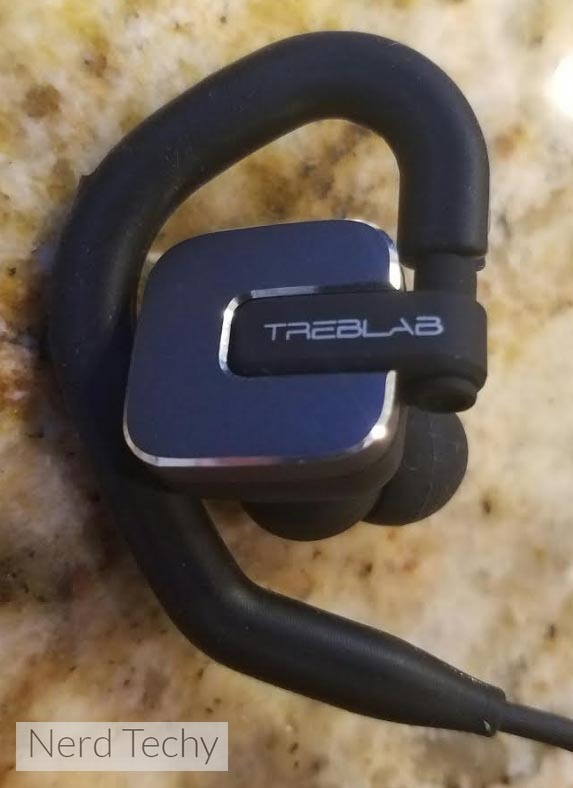 The ear grips attach to the headphones with a large plastic clip that’s decorated with a stylized Treblab logo. From the back, it looks as if the ear sleeves stick out a little more than you’d expect. What’s actually happening is that a small tubular riser is employed to position the ear pieces in exactly the right spot to get a snug fit in your ear canal. 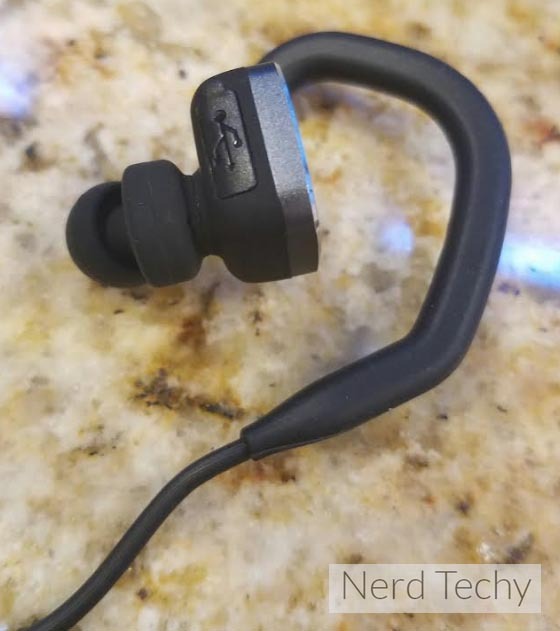 The headphones don’t fit any different than any other pair of ear buds, but the main encasement sticks out from your ear a fraction of an inch. This makes the earbuds look like something much more advanced than the typical “plug” style earbuds. But style isn’t all they have to offer, it’s the impressive performance that sets them apart. Noise cancelling comes in many different forms. Many headphones use what’s known as “passive” noise cancelling. This means that while the headphones don’t really do anything directly to stop the sound, their design means that they’re blocking outside noise from getting into your ear canal. Examples of passive noise cancelling would be tight ear pieces, or large, well-sealed ear cups like the ones used on high end over the ear headphones. While it’s true that the Treblab RF100 does have some passive cancellation, this is just a small part of the system. 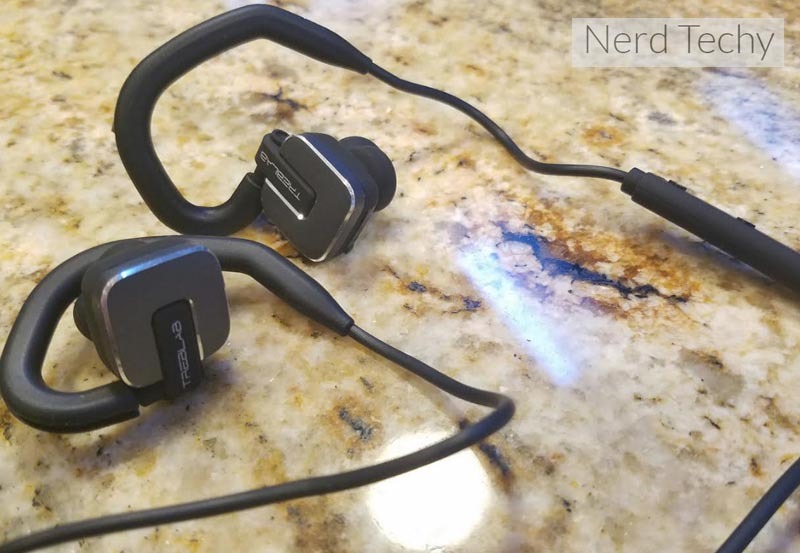 We will say that the passive noise cancellation is a little better than we’re used to with Bluetooth ear buds. But the real star of the show is the impressive ‘active’ noise cancellation circuit. The way it works, on paper, is simple. There is a microphone built into the headphones that’s always listening to your outside environment. When a noise, loud or quiet, hits the microphone, the headphones make an equal and opposite movement that effectively nullifies the sound wave. The end result is that if you put the headphones in your ear without any music playing, the sounds of the outside world seem to melt away, leaving you with a black canvas with which the headphones can paint the perfect audible picture. 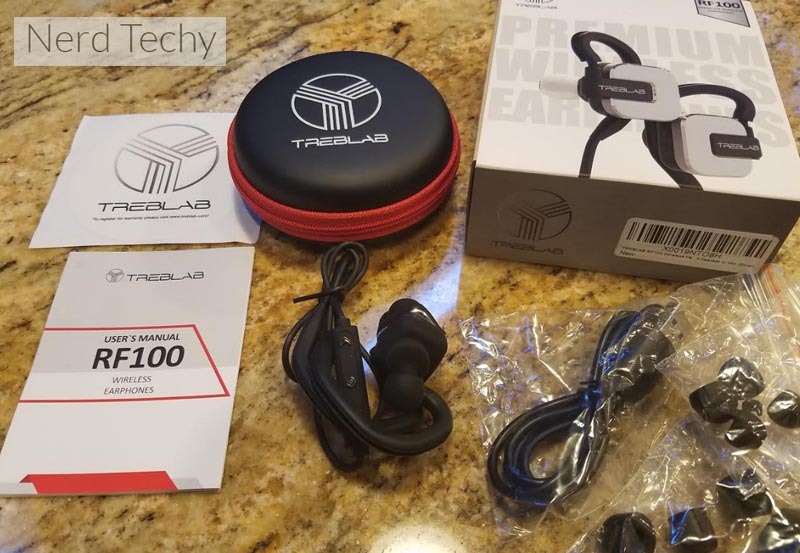 Having tried out several Treblab headphones before, we were expecting some decent performance for the money. But what we heard was well beyond what we expected. The headphones play back like a set of studio monitors. They aren’t too bassy, or too ‘anything’ for that matter. They sound incredibly clear, well balanced, and highly analytical. You can always tell that a headphone is well designed when, upon playing back songs that you’re extremely familiar with, you start to hear details come out that you haven’t noticed before. The powerful vocal sample at the beginning of “don’t” by Ed Sheeran sounds powerful on any set of speakers, but on these headphones you can easily tell that the sample is actually composed of multiple layers of the singer performing the same moment. You can almost pick the song apart, hearing both the individual elements, but also the complete song that they make up. This is because the headphones have low harmonic distortion. Harmonics are a lot like a chord. It’s multiple separate musical elements that, when played at the same time, create something that is larger than the whole. Inexpensive headphones often ruin harmonics. You still hear the correct note, but you’re not able to discern the elements that it’s composed of. That makes these headphones a great choice for serious music fans. If you’re looking for pounding bass, they might not be the best choice. But if you’re looking for something that takes the music you love and adds an entirely new dimension to it, this is a great choice. If there is one thing that all Bluetooth headphones have in common, it’s that they’re built for portability. These products are designed so that you can take the music you love with you, no matter where you are. But the important thing to consider is the fact that not all environments are suitable for electronics. Fortunately, the RF100 earbuds are designed to be a little more durable than your typical Bluetooth headphones. They’re IPX6 rated, which is a rigorous testing process that determines how much humidity electronics can withstand. IPX6 is one of the lower ratings, but it’s more than suitable for use in moderate moisture environments. Specifically, a light drizzle or sweat from a workout. This is better than most of the headphones on the market, and a serious plus we can chalk up for the RF100s. Another thing that Treblab did to keep the RF100’s ticking well past their typical expiration date was to make the cord from a lightweight rubbery material. Remember, this cord is designed only for the purpose of connecting the two earbuds together. Because it’s shorter, it’s more at risk to get tangled in your pocket. But the light rubber they used isn’t as sticky as most cables, preventing it from tangling up in your pocket the way that some do. At this price point, the sound quality is more than enough for us to justify purchasing these headphones. But there are a few other features that we were quite impressed to see. 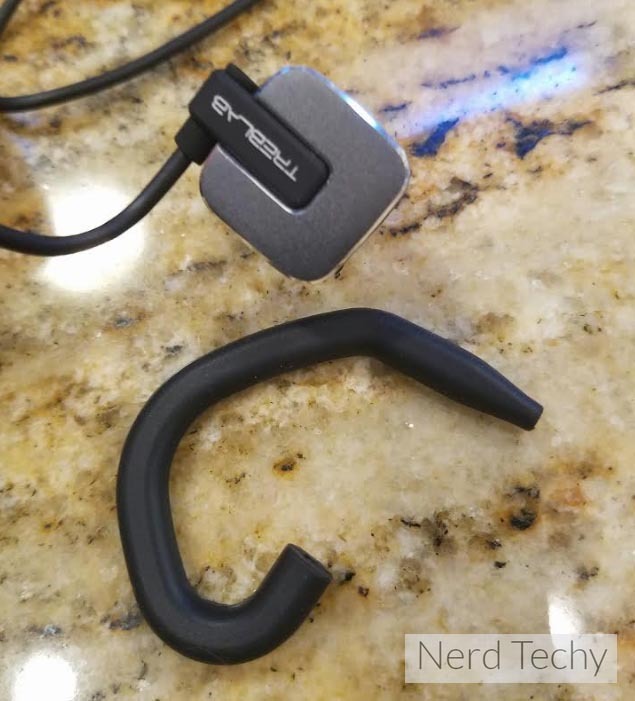 They use the built-in noise cancellation microphone for voice chat, so if you ever receive a call you can just push the cord-mounted button to start a real-time chat. They also include a handy little carrying case, making it easy to carry these earbuds with you wherever you go. Treblab advertises “up to” hours of battery life, and we think this might be a bit of a stretch. Theoretically, you might be able to hit this limit if you listen to your music quietly. But if you’re anything like us, you like to keep it cranked. In our tests, we got about 6 to 7 hours of battery life depending on what we were doing with the headphones. For calls, they last a little longer. But music should be within the range we mentioned. It takes about 2 hours to charge them from completely empty to completely full, so every 20 minutes you have them on the charger should give you 1+ hour of use. 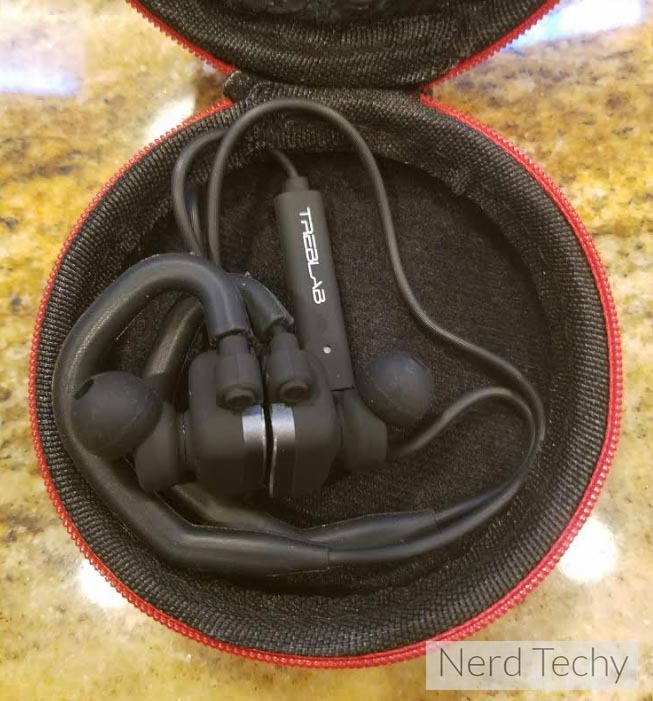 While the sound quality is very impressive for the price point, this means that the headphones lend themselves better to some types of music instead of others. We found that they sound best with anything acoustic. Classic rock, vocal pop, orchestral, or anything that’s real recorded instruments will sound incredible. But some styles of music rely on the bass heavy playback that’s become so popular with headphones these days. This limits their target audience a little, but is another example of Treblab creating products that cater to a specific niche. 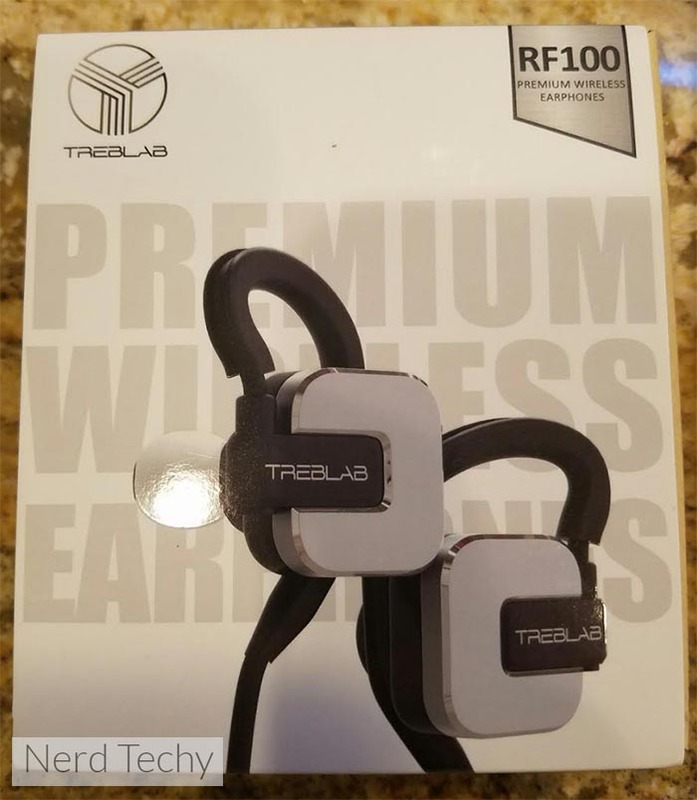 If you’re into acoustic music and want a surprisingly clear pair of headphones for a dirt-cheap price, the Treblab RF100 Bluetooth Headphones are a great choice. They sound incredibly with any acoustic, or vocal heavy song. To date, we haven’t found a pair of portable earbuds in this price range that can reproduce music the same way. Of course, as with any subjective product, they’re not for everyone. If you’re looking for a lightweight pair of headphones that are suitable for use with bass heavy music, you might want to consider the Treblab X11. 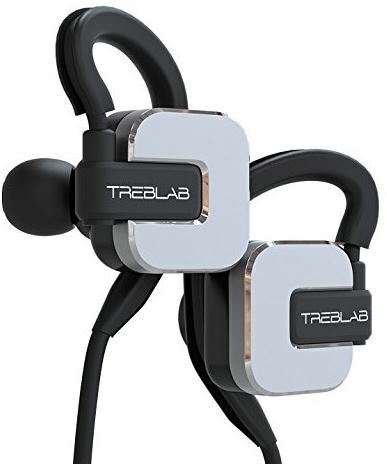 Those headphones are designed to compete in a space that is a little more crowded, but as usual Treblab did a great job. Also be sure to check out the Treblab XR100 and XR500 Bluetooth Headphones as well. I actually own these. Purchased them back in December. I find the RF100 to be very good with EDM as I infact feel they have a very strong bass presence, yet are very clear sounding. They even sound great listening to some 90s Hip Hop. I think these are all around great headphones.